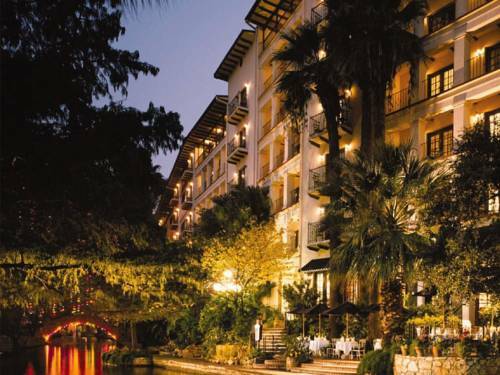 Located in the heart of San Antonio along the banks of the historic River Walk, the Omni La Mansion del Rio is where history comes alive. Perfectly situated for any visitor seeking to explore all of San Antonio's extensive range of tourist attractions. The property is within walking distance of the fabled Alamo, El Mercado, and convention center. Theater: The 338 room hotel has 16 meeting rooms with 15000 sq ft including the 3913 sq ft Iberian Ballroom that can accommodate groups up to 500. Most meeting rooms have windows for natural lighting. An experienced event and meeting planning staff is readily available for consultation. San Antonio InternationalNo free shuttle transportation to property. AzucaDowntown restaurant featuring upscale Latin food. Tower of the AmericasTower with observation deck restaurant and 4-D theater ride. Austin-Bergstrom International AirportNo free shuttle transportation to property.